These adorable topiary-style dogs feature plenty of personality along with lights that sparkle and shine. A unique addition to your yard or patio, each features 15 LED lights and requires 2 "AA" batteries (not included). Polyester and wire. 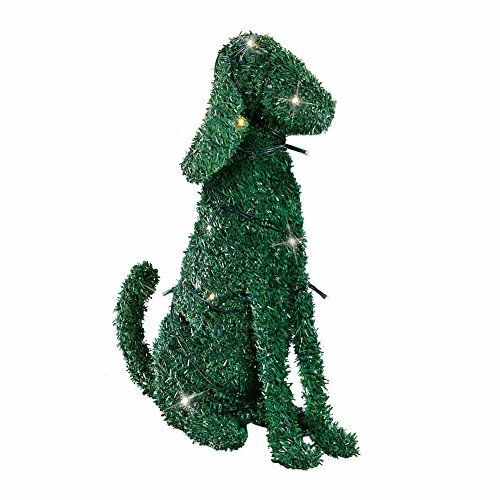 Size available in Short Dog: 14"L x 5 1/2"W x 11 1/2"H or Tall Dog: 14"L x 5 1/2"W x 17 1/2"H.
Topiary-style dogs feature plenty of personality along with lights that sparkle and shine. Each features 15 LED lights. Requires 3 "AA" batteries (not included). Polyester and wire.